You were advised Thyroid surgery by your doctor after thorough evaluation of your symptoms and signs. The reasons for which thyroidectomy is performed include overactive thyroid gland, cancer of the thyroid, noncancerous (benign) tumors of the thyroid, thyroid swelling (nontoxic goiter) that makes it hard for you to breathe or swallow. 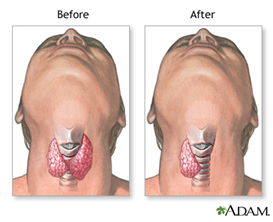 Thyroidectomy is surgery to remove all or part of the thyroid gland. The thyroid gland is a butterfly-shaped gland that lies over your trachea (the tube that carries air to your lungs). You have undergone a partial thyroidectomy surgery when you were in the hospital. The surgeon had made a surgical cut in the middle of your neck, right on top of the thyroid gland. They then removed the culprit part of your thyroid gland being very careful not to damage the blood vessels and nerves in your neck. For the first few days after surgery, you may need to keep your incision dry. Within a week, you should be able to resume most low-key activities. However, wait 2 to 4 weeks before doing anything strenuous, such as heavy lifting. After surgery, you may need to take medications. These may include pain medication, thyroid hormone, calcium supplements, or antibiotics (if you go home with a drain in place). Your incision should flatten out and the scar should fade in about 6 months. Be sure to use sun-block on the scar for the first year after surgery. You may have a drain attached to a bulb coming from your incision. Injury to the nerves in your vocal cords and larynx. You may have problems reaching high notes when you sing, hoarseness, coughing, swallowing problems, or problems speaking. These problems may be mild or severe. Difficulty breathing. This is very rare. It almost always goes away several weeks or months after surgery. Injury to the parathyroid glands (small glands near the thyroid) or to their blood supply. This can cause temporary low levels of calcium in your blood (hypocalcemia) and its associated symptoms including tingling and numbness sensation in finger tips, twitching of muscles especially around face, cramps etc. Too much release of thyroid hormone (thyroid storm). If you have an overactive thyroid gland, you will be treated with medicine. Numbness or tingling in your face or lips. Give yourself some time to heal. For about a week, do not do any strenuous activities, heavy lifting, jogging, or swimming. Slowly start your normal activities when you feel ready. Do not drive if you are taking narcotic pain medicines. You may be advised some neck exercises. Do them diligently. Complete physical recovery after thyroidectomy might take about 6-8 weeks. One can typically get back to work or drive after 2 weeks of the surgery. Your neck muscles will probably be sore, so refrain from exercising, lifting heavy items and playing extreme sports like football, cricket etc. You may experience a change in voice quality and in some cases this could be a permanent one. Talk to your doctor about consulting a speech therapist. For a few days, after surgery, your doctor may recommend clear fluids and then graduating to soft foods till you can swallow and handle regular food. Here are some more tips that can reduce the uneasiness. Cook the food well, make it soft and puree it. For instance puree soft khichidi made with rice and dal for meals. Incorporate Dairy into the diets. Use milk, yoghurt, cheese, cream and eggs into dishes to incorporate more protein and fat into meals. Cook the meats and vegetables extensively prior to pureeing it. Soft and ripe fruits like banana, sapota, pear and mango are appropriate to eat. Choose foods high in Good Fat such as olive oil, peanut oil. Incorporate it into the dishes, smoothies or soups. Drink lots of Water (1-2 Cups with every meal/snack). Avoid tough or undercooked foods such as raw vegetables, chapatti, brown rice etc. into the diet. Avoid highly Fatty, fried, greasy and spicy foods as they can be hard to swallow and also harsh on the operated site. Avoid Unhealthy Fats such as Cholesterol, Saturated and Trans Fat. Stay away from packaged food, deep fried items, dalda, vanspati. Eat healthy and Live happier.